Background In 2012, a European initiative called Single Hub and Access point for pediatric Rheumatology in Europe (SHARE) was launched to optimise and disseminate diagnostic and management regimens in Europe for children and young adults with rheumatic diseases. Juvenile dermatomyositis (JDM) is a rare disease within the group of paediatric rheumatic diseases (PRDs) and can lead to significant morbidity. Evidence-based guidelines are sparse and management is mostly based on physicians' experience. Consequently, treatment regimens differ throughout Europe. Objectives To provide recommendations for diagnosis and treatment of JDM. Methods Recommendations were developed by an evidence-informed consensus process using the European League Against Rheumatism standard operating procedures. A committee was constituted, consisting of 19 experienced paediatric rheumatologists and 2 experts in paediatric exercise physiology and physical therapy, mainly from Europe. Recommendations derived from a validated systematic literature review were evaluated by an online survey and subsequently discussed at two consensus meetings using nominal group technique. Recommendations were accepted if >80% agreement was reached. Results In total, 7 overarching principles, 33 recommendations on diagnosis and 19 recommendations on therapy were accepted with >80% agreement among experts. Topics covered include assessment of skin, muscle and major organ involvement and suggested treatment pathways. Conclusions The SHARE initiative aims to identify best practices for treatment of patients suffering from PRD. Within this remit, recommendations for the diagnosis and treatment of JDM have been formulated by an evidence-informed consensus process to produce a standard of care for patients with JDM throughout Europe. In 2012, Single Hub and Access point for pediatric Rheumatology in Europe (SHARE) was launched with the aim of optimising and disseminating diagnostic and management regimens for children and young people with rheumatic diseases. This includes juvenile dermatomyositis (JDM); the focus of this paper. Clear recommendations can help clinicians in the care of patients with JDM as no international consensus regarding diagnosis and treatment is currently available and management therefore varies. The electronic databases PubMed/MEDLINE, Embase and Cochrane were searched twice for eligible articles in June 2013 and subsequently in February 2015. All synonyms of JDM were searched in MeSH/Emtree terms, title and abstract. Reference tracking was performed in all included studies (full search strategy in online supplementary figure S1). Experts (FBE, LJMC, AvR-K) selected papers relevant to JDM investigations and/or treatment to be taken forward for validity assessment (inclusion and exclusion criteria shown in online supplementary figure S1). All full-text scored papers are listed in online supplementary list S1. A panel of experts (two per paper) independently assessed the methodological quality of papers meeting inclusion criteria (see online supplementary figure S1) and extracted data using predefined scoring forms for diagnostic3 and therapeutic studies.4 Disagreements were resolved by discussion or by the opinion of a third expert. Adapted classification tables for diagnostic,5 therapeutic1 ,6 and epidemiological studies7 were used to determine the level of evidence and strength of each recommendation. As part of the EULAR standard operating procedure, experts described the main results and conclusions of each paper, along with validity and level of evidence. These descriptions were collated by three experts (FBE, LJMC and AvR-K) and used to formulate provisional recommendations (N=65). A summary of the evidence was presented along with each provisional recommendation to the expert committee (n=21) in an online survey (with 100% response rate). Recommendations were revised according to responses and discussed at two sequential face-to-face consensus meetings in March 2014 (Genova, number of experts participating: N=13) and 2015 (Barcelona, number of experts participating: N=15), using Nominal Group Technique.8 A non-voting expert (AR) facilitated the process. Recommendations were accepted when ≥80% of the experts agreed. The following section describes recommendations with corresponding supporting literature. Tables 1⇓–3 summarise the recommendations, their levels of evidence, recommendation strength and percentage of expert agreement for each. Of note, 39 out of the 59 recommendations accepted are based on expert opinion (level of evidence 4, a strength of evidence D). Recommendations not reaching ≥80% agreement are listed in online supplementary table T1 (N=6). JDM is the most common idiopathic inflammatory myopathy of childhood, but the incidence is very low; 2–4 cases per million children per year (table 1).10 Standardisation of diagnostic tests and treatment regimens will enable collaborative research studies to increase knowledge of this rare disease.11 JDM vasculopathy principally affects muscles and skin, but may affect other organs and cause constitutional symptoms. With early treatment, 30–50% of patients have the potential to reach remission within 2–3 years of disease onset with few complications and a mortality rate of <4%.12–15 However, polycyclic or persistently active disease has been described in 41–60% of cases in recent cohort studies (depending on activity measures used) and complications like calcinosis, persistent muscle weakness, skin or muscle atrophy remain problematic.12 ,14–19 Risk of lipodystrophy and calcinosis has been associated with greater duration of active disease and inadequate corticosteroid therapy.15 ,17 ,20 ,21 Quality of life may be impaired compared with healthy controls15 in both physical and psychosocial domains, requiring psychosocial support. In view of the rarity and seriousness of the condition, it was agreed that children with JDM should be cared for in centres with experience and expertise in this condition. Treatment goals include control of disease activity, prevention of organ damage and improvement in quality of life with participation in daily activities. Evaluation of treatment response (including measurement of disease activity or disease damage and monitoring adverse effects of immunosuppressive medication) is an important cornerstone of management.22–24 Many standardised tools, developed primarily for research, are available for this, including the disease activity score (DAS) and myositis disease activity assessment tool.25 It is recognised that registries provide useful resources to investigate rare disease such as JDM.11 In order to better understand prognosis and enhance therapeutic development of this rare disease, the expert group found it important to recommend that all patients JDM should have the opportunity to participate in a research registry. Diagnostic criteria for dermatomyositis, established by Bohan and Peter in 1975, include five items: characteristic skin rash, proximal muscle weakness, raised muscle enzymes, myopathic changes on electromyogram (EMG) and typical muscle biopsy (table 2).26 These are currently being revised through the International Myositis Classification Criteria Project.27 Current practice reveals the necessity of broadening diagnostic criteria by incorporating new techniques, such us MRI and ultrasound, and the significance of skin disease in JDM.14 ,15 ,21 ,28 ,29 The expert group suggested a non-exhaustive list of investigations for consideration in every patient in whom the diagnosis of JDM is suspected. More specific recommendations have also been established. The expert group advises biopsy when presentation is atypical or diagnosis is in doubt. Use of a standardised JDM biopsy score tool to quantify severity of histological abnormalities is recommended.42 Different markers have been suggested to typify muscle inflammation in patients with JDM, like major histocompatibility complex (MHC) class I, vascular cell adhesion molecule (VCAM), intercellular adhesion molecule (ICAM), CD59 and toll-like receptor (TLR),43–48 but these need further validation. Expert histopathological opinion is required to define use of these markers for diagnosis of JDM based on muscle biopsy findings. The literature suggests that needle biopsy is a safe and cost-effective alternative to open biopsy in adult patients.49 However, this has not been evaluated sufficiently in children to result in a recommendation. Ultrasonography has been found in small patients cohorts (7–10 patients) to be a useful tool for myositis.50 ,51 The expert group suggests that when MRI or muscle biopsy is not possible muscle ultrasonography may be an alternative to assess myositis activity. The literature suggests that swallowing dysfunction, including silent aspiration, is under-recognised and not always predicted by generalised muscle weakness.52 The expert group recommend that patients at risk of swallowing difficulties (eg, those presenting with nasal speech or coughing during swallowing) should have an objective assessment based on local experience (speech and language therapy assessment, video fluoroscopy/barium studies). Understanding of cardiac manifestations in JDM is limited. One long-term complication is hypertension due to steroid treatment.65 Case studies report the presence of pericarditis, endocarditis and cardiac arrhythmias.66 ,67 Recent evidence using echocardiography has detected systolic and diastolic dysfunction, particularly in patients with high long-term organ damage scores (MDI, follow-up) and high early skin (but not muscle) disease activity (DAS skin, year 1). Notably, most patients were asymptomatic. The authors of the study suggest that vasculopathy in the myocardium resembles vasculopathy in the skin.65 The long-term clinical consequences of abnormal echocardiographic findings in asymptomatic patients with JDM are unclear. The expert group recommends cardiac evaluation by ECG and echocardiography for all patients. Repeated cardiac evaluation should be considered in patients with high risk of cardiac involvement; risk factors include hypertension, high disease activity 1 year post diagnosis, long-term high corticosteroid burden or chronic ongoing active disease.65 Echocardiac changes are recognised even when patients are in clinical remission65 ,68 and thus long-term cardiac evaluation should be considered for patients at high risk. There is currently insufficient evidence to advise on frequency and duration of monitoring. Antinuclear antibodies are frequently positive in patients with JDM (prevalence varies through different populations), but no diagnostic value has been established.80 Increasing evidence supports association between serotype and clinical phenotype.81 Myositis-specific autoantibodies target either nuclear or cytoplasmic components involved in gene transcription, protein translocation and antiviral responses. The literature suggests that the presence of anti-p155 (anti-TIF1γ) myositis-associated antibodies (MAA) predicts worse cutaneous involvement, anti-p140 (also known as NXP-2 or MJ), predicts calcinosis, severe disease course and persistent disease activity, and anti-MDA5 is associated with increased risk of skin and oral ulceration, arthritis, milder muscle disease and interstitial lung disease. The association with severe lung disease was most striking in Japanese patients. Anti-signal recognition particle (SRP) is associated with necrotising autoimmune myopathy.20 ,82–90 The studies mentioned above provide control sera derived from adults and none of these autoantibodies have been validated to date in large patient cohorts. At the time of publication, there is insufficient evidence to recommend measurement of autoantibodies for risk stratification due to lack of validation and data in patients from different ethnicities. However, when available, measurement of myositis-specific antibodies or MAA may be helpful, but should be performed and validated in a laboratory with experience and expertise. The expert group proposed recommendations for treatment of newly diagnosed patients and resistant disease. Treatment of refractory patients with or without calcinosis15 is still a challenge. Treatments used for refractory disease include IVIG, cyclophosphamide, CsA, azathioprine, mycophenolate mofetil (MMF), hydroxychloroquine, tacrolimus, rituximab, infliximab and autologous stem cell transplantation.9 ,96 ,98–112 No head-to-head or superiority trial has been carried out. Published data suggest that early aggressive treatment may decrease incidence of calcinosis.14 ,15 ,21 ,71 ,91–94 Established calcinosis may respond to treatment with bisphosphonates (pamidronate/alendronate), infliximab, abatacept, diltiazem, probenecid, intravenous immunoglobulins, intralesional steroids or surgical resection.101 ,111 ,113–124 Evidence for individual treatments is limited to case reports, except infliximab, diltiazem and pamidronate (case series of five, four and three patients, respectively); therefore, no recommendation regarding a specific treatment of calcinosis was made. Therapeutic trials are hampered by recruitment of sufficient numbers of patients with JDM, but also by limited tools or biomarkers to measure outcome. Currently, there is no uniform, simple and practical tool to evaluate improvement or inactive disease to guide individual treatment. PRINTO and IMACS have developed preliminary definitions of improvement (DoI) for use in clinical trials, which include multiple assessments of core set measures (CSMs). Although the CSMs used within DoIs differ slightly, PRINTO and IMACS both expect at least 20% improvement in three out of six CSMs with no more than one or two other core set measures getting worse and muscle strength not allowed to worsen.74 ,125 These definitions and recommendations are best suited to clinical trials, with appropriate infrastructure, but are time consuming in clinical practice. In 2012, CARRA developed a single-consensus steroid taper plan, including when and how to stop steroids.126 However, the SHARE expert group did not agree to a specific steroid-tapering regimen. In 2012, PRINTO published criteria defining clinically inactive disease; necessitating fulfilment of three out of four variables from CPK ≤150 U/L, CMAS ≥48, MMT8 ≥78 and PGA score of overall disease activity ≤0.2.34 These criteria are weighted towards muscle disease, and when tested in a Norwegian cohort127 CPK was found not to differentiate well between active and inactive disease. When tested in a UK cohort, without PGA, there was a high incidence of skin disease, leading to the suggestion that PGA should be an essential criterion since it is the only measure that includes skin activity.128 The expert group determined that treatment should be escalated if a patient has inadequate response to treatment, including isolated skin disease. There is no high-level evidence regarding when to stop immunosuppressive therapy. The expert group suggested considering the withdrawal of MTX (or alternative disease-modifying drug) once the patient is in remission and off steroids for a minimum of 1 year. 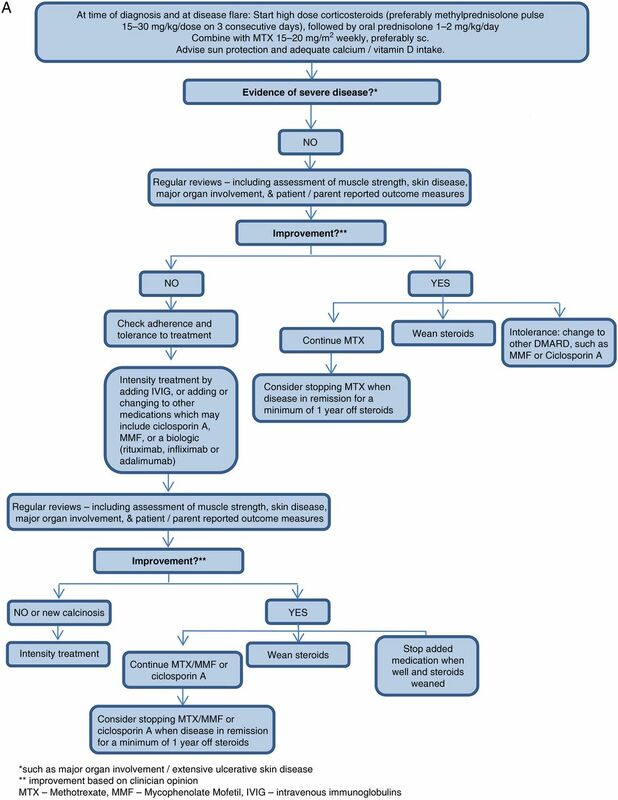 Flow chart for the treatment of mild/moderate disease in newly diagnosed and refractory patients with juvenile dermatomyositis (JDM). 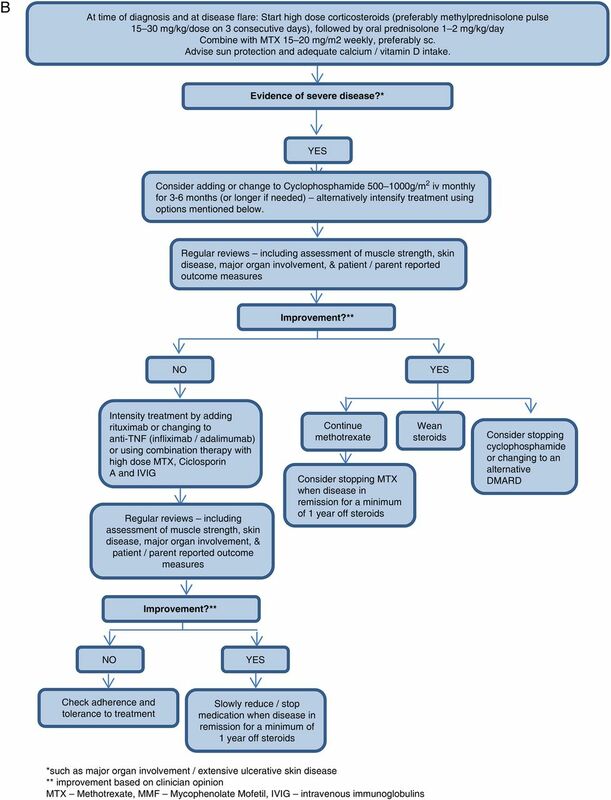 Flow chart for the treatment of severe disease in newly diagnosed and refractory patients with juvenile dermatomyositis (JDM). The JDM working group of SHARE formulated a total of 62 recommendations for the diagnosis and management of JDM, based on a systematic literature review and consensus procedure. In total, 7 overarching principles, 33 recommendations on diagnosis and 19 on therapy were accepted with >80% agreement among the experts. Topics include assessment of skin, muscle and major organ involvement and treatment suggestions at disease onset and in refractory disease. Diagnostic criteria in JDM are under revision, but will need further adjustment as new outcome tools, especially autoantibodies and biomarkers, are being developed. Close monitoring of patients' disease status and well-being by an experienced multidisciplinary team is essential for a good clinical outcome. Recent evidence highlights the importance of treating skin disease aggressively as it is associated with high morbidity. Long-term follow-up studies are warranted to clarify complication risks. Given the disease rarity, international collaboration is crucial to recruit sufficient patients. Validated scores for disease activity and damage are needed in order to perform a structured assessment of outcome. Disease activity and damage scores have been developed, principally for clinical trials, but may be challenging and time consuming to use in daily clinical practice. To conclude, this SHARE initiative is based on expert opinion informed by the best available evidence and provides recommendations for the diagnosis and treatment of patients with JDM, along with other paediatric rheumatic diseases129 with a view to improving the outcome for patients with JDM in Europe. It will now be important to broaden discussion and test acceptability of these to the wider community. This SHARE initiative has been endorsed by the executive committee of the Paediatric Rheumatology European Society and the International Society of Systemic Auto-Inflammatory Diseases. Collaboration, T. C. Cochrane Handbook for Systematic Reviews of Interventions Version 5.1.0. 2013.
. MHC class I and II expression in juvenile dermatomyositis skeletal muscle. Clin Exp Rheumatol 2009;27:519–26.
. Immunohistological analysis of CD59 and membrane attack complex of complement in muscle in juvenile dermatomyositis. J Rheumatol 2002;29:1301–7.
. MHC Class I overexpression on muscles in early juvenile dermatomyositis. J Rheumatol 2004;31:605–9.
. Capillaroscopic observations in childhood rheumatic diseases and healthy controls. Clin Exp Rheumatol 2005;23:905–11.
. Decreased capillary density in juvenile dermatomyositis and in mixed connective tissue disease. J Rheumatol 1999;26:1377–81.
. In juvenile dermatomyositis, cardiac systolic dysfunction is present after long-term follow-up and is predicted by sustained early skin activity. Ann Rheum Dis 2014;73:1805–10.
. Monitoring disease activity in juvenile dermatomyositis: the role of von Willebrand factor and muscle enzymes. J Rheumatol 1994;21:739–43.
. von Willebrand factor in juvenile dermatomyositis. J Rheumatol 1995;22:320–5.
. Neopterin and quinolinic acid are surrogate measures of disease activity in the juvenile idiopathic inflammatory myopathies. Clin Chem 2002;48:1681–8.
. Intravenous immunoglobulin therapy for juvenile dermatomyositis: efficacy and safety. J Rheumatol 2000;27:2498–503.
. Methotrexate and azathioprine treatment of childhood dermatomyositis. Pediatrics 1977;59:212–8.
. Adjunctive use of hydroxychloroquine in childhood dermatomyositis. J Rheumatol 1989;16:1545–7.
. Rapid improvement of calcinosis in juvenile dermatomyositis with alendronate therapy. J Rheumatol 2005;32: 1837–9.
. Treatment of calcinosis in juvenile dermatomyositis with probenecid: the role of phosphorus metabolism in the development of calcifications. J Rheumatol 2001;28:1129–32.
. Effectiveness of the treatment with intravenous pamidronate in calcinosis in juvenile dermatomyositis. Clin Exp Rheumatol 2010;28:135–40.
. Efficacy of probenecid for a patient with juvenile dermatomyositis complicated with calcinosis. J Rheumatol 2006;33:1691–3. Contributors LJM and AvR-K are senior authors. NW and SV designed the SHARE initiative. FBE performed the systematic literature review, supervised by LMC and ARK. Validity assessment of selected papers was done by FBE, BB-M, BMF, CP, AR, MvB, JvdN, SV, LRW, NW, LJMC and AvR-K. Recommendations were formulated by FBE, LJMC and AvR-K. The expert committee consisted of FBE, BB-M, EB, TC, PD, BMF, PL, BM, KN, CP, SO, AvR-K, RR, YU, JvdN, NW, LRW, MvB, SV, LJMC and AvR-K; they completed the online surveys and/or participated in the subsequent consensus meetings. AR assisted in the preparation of the two live consensus meetings with FBE, LJMC, AvR-K and facilitated the consensus procedure using nominal group technique. FBE, AvR-K and LJM wrote the manuscript, with contribution and approval of all co-authors. Funding This project was supported by a grant from European Agency for Health and Consumers (EAHC), grant number 20111202.